Cheng Sui belonged to a group of loyalist-literati known as 'yimin' or 'left-over people', who refused to transfer their political allegiance from the native Ming to the alien Qing. His dissent was expressed in the literary name he took for himself - 'Goudaoren' (dusty or grim monk) - thus indicating his regret and pain at being unable to stop the foreign conqueror. The effect of dynastical change on Cheng Sui and his painting style is reflected in these albums, painted in 1670, some two decades after the decline of the Ming dynasty. 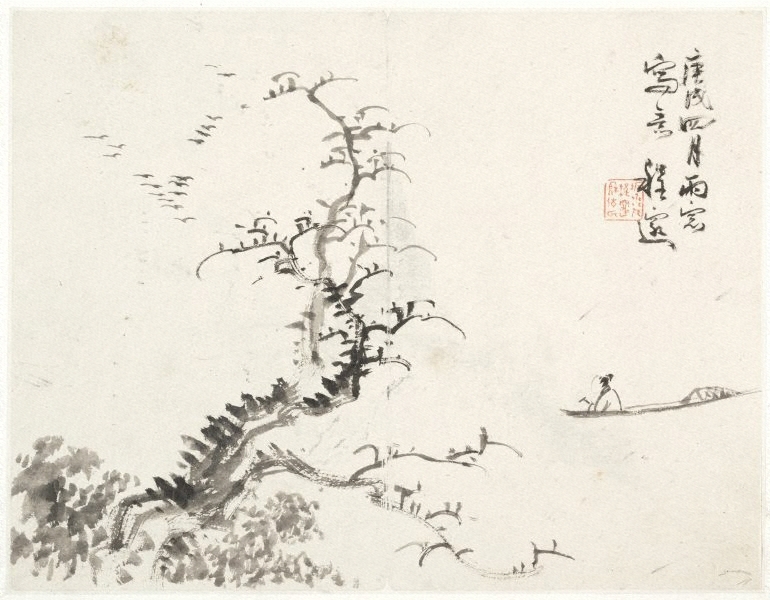 The choice of subject matter is not new: we see simple huts standing by shores, secluded temples concealed in mountains, an isolated boat with a man drifting between river and sky, and a lonely scholar strolling alone along the streamside. However, one can immediately sense the certain plainness, a melancholy and often bleak and lonely feeling. All these sentiments were reinforced by his characteristic dry and bold brush outlines, added by small dots of dry dark ink. Inscriptions were also brushed with very dry ink, echoing the brush works of the landscape.